The Vehicle Booking System - or VBS – is a real-time appointment system used by hauliers wishing to deliver or collect containers at The Port of Felixstowe. The simple-to-use web-based system allows hauliers to select a time for their visit, enabling the Port to proactively manage customer demand, providing a faster turnaround. In addition, each time the haulier creates a new booking, VBS checks and confirms that the customer’s details are correct, thereby greatly reducing wasted journeys and expense caused by incorrect information. Registering for VBS is a simple process. 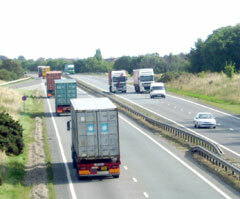 Once registered, a haulier will be given their own unique account, where they can create and manage their haulier arrivals at the Port of Felixstowe on-line. Hauliers can register for VBS by completing and returning these forms or start the VBS Application by clicking here. To ensure a haulage operator, or driver, can safely deliver to or collect from the Port of Felixstowe.